All repaving jobs include complete removal of existing asphalt. Pavement edges are blended with adjacent landscaping, then seeded and mulched for a flawless finish. Expert Care from start to finish – We Guarantee it! When you call Krukoff Excavation & Paving to your home or business, you will be pleased to know that the person you meet at the time of the estimate is the owner of the company, the same person who comes to work on the job, runs the equipment and supervises the crew. Our competitors may send out a salesperson to your site to create the work order, provide an estimate and answer your questions about drainage or paving. Owner Steve Krukoff believes that there’s an advantage to doing business with the owner/operator from day one. A detailed plan of the job site is mapped out while assessing your project to illustrate the scope of the project to you. This plan is accompanied by a detailed checklist and a written estimate. We offer a full 3 year written warranty against any workmanship defects. 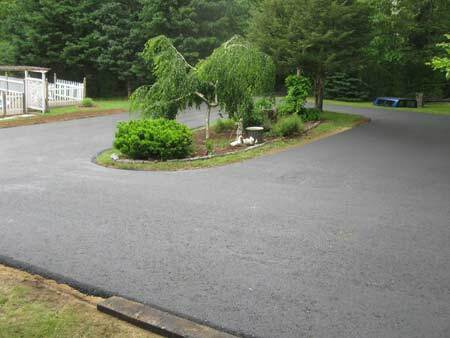 A typical driveway job can be prepped and paved in the same day. 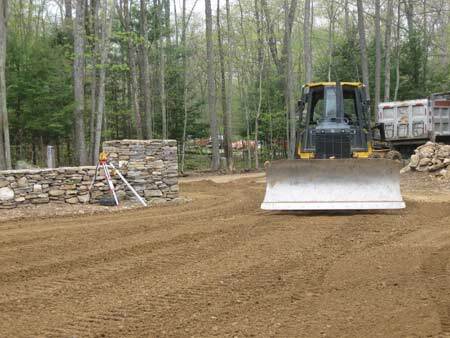 We use a compactor and a vibratory roller twice over the driveway surface before it is paved. That is why our driveways can handle the weight of oil trucks, cement mixers, and heavy equipment. There are no visible lap marks in our pavement, which is compacted while still hot prior to rolling, resulting in a glass-smooth finish which is impervious to automotive fluids and rainwater. We feel our driveways are complete, therefore sealing offers no benefit, nor does it prolong the life of our work. Our service area includes the following towns and their respective villages: Andover, Ashford, Brooklyn, Canterbury, Chaplin, Columbia, Coventry, Eastford, Ellington, Franklin, Hampton, Killingly, Lebanon, Manchester, Mansfield, Pomfret, Putnam, Scotland, Stafford, Thompson, Tolland, Union, Vernon, Willington, Windham, and Woodstock. Thank you for visiting our site. If you have any questions regarding our services, or if you’d like a free estimate on your next project, please contact us at 860-429-7349. We look forward hearing from you!